In the blind attack that is made on astrolgoy by scientists, particularly by a Poona based astronomer, it has often been said that in astrology be established. His argument is totally irrational and unscientific as the argument of other critics of astrology. They should learn astrology before attacking it on this ground. In such an ignorant attack made on astrology even in courts of law, first in Madras later in Hyderabad and finally in the Supreme Court which was decided in favour of astrology on 5 May 2004, almost such an argument was taken, though vaguely, with all such irrational attacks on astrology which appeared in English newspapers, weeklies and dailies, for four years were given annexures. It was a compilation of attakcs on astrology by the irrational elitist classes of India whose claim to distinction is only their knowledge of English and lack of common sense. The truth of the matter is that astrological techniques are and have been kept secrets not to allow them to fall into wrong hands. But these days when in the extremely maddening competetive times people face too many tensions, there are astrologers and astrologers who instead of concentrating on guidance, make fortunes through the prescription of costly remedial measures and enrich themselves. If this tendency is attacked and if some of such astrologers are dragged to consumer courts, astrology will get cleansed and reformed. To understand the scientific basis of astrology the following factors should be taken into account. 1. Here there is a clear relation between cause and effect but not in a physical way which is what can never satisfy physical scientists who can never move out of their frong-in-well mentality and approach. Here the cause is invisible but the effect becomes visible when a question is asked and a prediction is given and the feedback reveals the correctness of a prediction. 2. There is a vastly developed method of preparing the data like the birth horoscopes, fifteen other divisional horoscopes, considering yogas and using dashas to time events along with the transit of planets. 3. From ancient times, on the basis of repetetive patterns of some events, statistically valid and replicable techniques have existed which traditional astrologers have learnt, applied but kept them as secrets for reasons best known to them. We will produce some monographs on some different and simple techniques after testing them on hundreds of horoscopes but will keep ourselves confined only one hundred horoscopes as instances. At the end of these horoscopes we will show through tables how validlythese simple techniques work and how valid they are. 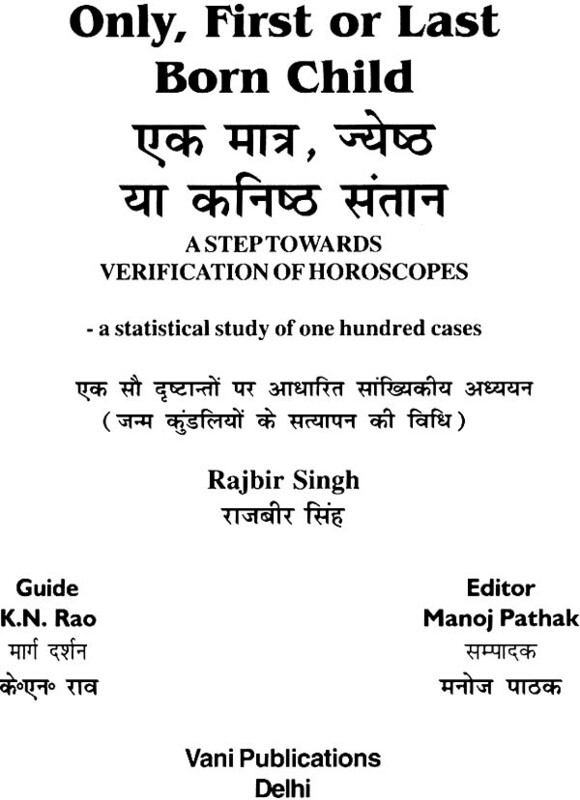 In each monograph we will define the paramaters being applied which are very simple, uncomplicated and can be tested even by a rank beginner in astrology. Unless such exercises are done no astrologer will be able to convince himself that he is doing a super scientific subject which becomes visible through the simple parameters. 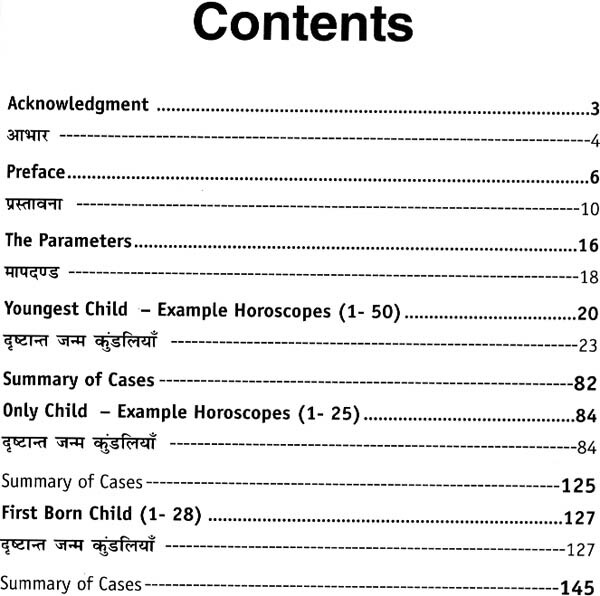 The subject of this monograph is ask a person who comes to consult you IF HE IS THE YOUNGEST CHILD OF HIS PARENTS and test it applying the four simple parameters given. 1.An astrologer should be able to ascertain if a person is the eldest child of his parents. 2. This will help verify the correctness of a horoscope and the lagna because when we get horoscopes of people who have some doubt about their birth time or when we get lagnas between two rashis, what is known as sandhi, we can easily fix it through a series of simple rules, out of which this rule will be found helpful as the first step. 3. There will be some exceptions to the rules given here. In such cases, there are some additional main rules and supplementary rules which can be applied to see whether they are fitting into the pattern of this research or if the horoscopes themselves are wrong. 4. These parameters have been checked in the research class and a blind clinical test also applied often. It can be tested further and the size of sample can be increased to many thousand and many millions. 5. The exceptions that occur will be explained later. But to eliminate such errors it is better to see the bhava chart also as in this example. WHAT IS GIVEN IN ASTROLOGICAL CLASSICS? What is given in classics of Hindu jyotish gives us some hints to see about Siblings in a horoscope but without every pointing if a child would be the eldest, youngest, only or one of the many in the middle. This becomes a good topic for research as this is a good method of fixing someone's lagna properly and then correct the birth time. 1. If the third house has benefics or is aspected by benefics there will be the happiness of siblings. 2. If the third lord and Mars are conjoined by malefics it proves tragic for siblings. 3. If female planets influence the third house there will be sisters and male planets do it there will be brothers. If there are mixed influences there will be both brothers and sisters. 4. If the third lord and Mars are placed in the eighth house and are conjoined or aspected by malefics it proves tragic for siblings. 5. If the third lord and the siblings giving planet (Mars) be in kendra or trikona, in friends' houses or in own vargas there is happiness from Siblings. 6. If Mercury is placed in the third house and the third lord is conjoined with Moon and Mars is with Saturn then a sister is born, then a brother and the third one after the native dies. 7. If the lord of the third house is with Rahu there will be no siblings after the native but there will be three elder ones. 8. If the third lord is in a kendra and if Mars is in kendra with Jupiter is exalted there will be twelve siblings. And out if them two elder siblings and the third, seventh, ninth and twelfth will die and only six will be long lived. 9. If Mars conjoined with the eleventh lord or with jupiter and Moon is in the third house there will be seven siblings. 10.If Moon placed in the third house has the influence of male planets then a brother if by Venus then a sister can be predicted. 11. 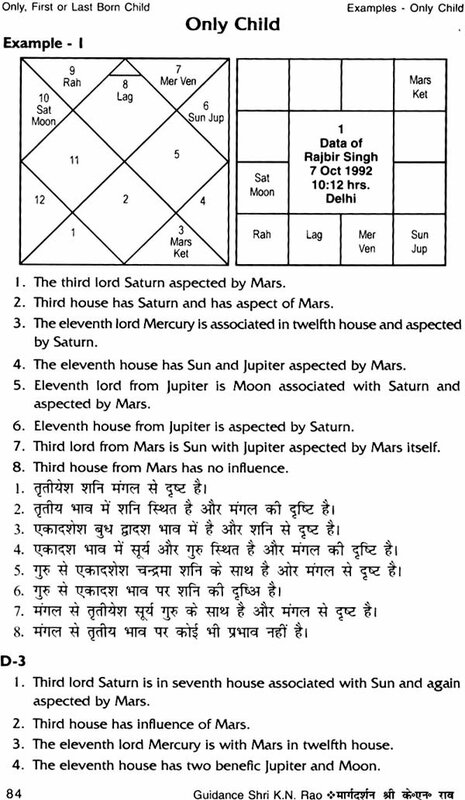 If Sun is placed in the third house the elder brother dies, if Saturn the younger and if it is Mars both die. 12. If the eleventh lord is in the third house, the native will have siblings is the only hint given about siblings with respect to the eleventh lord. Note: The useful hints we get here are with regard to Rahu, Mars, Saturn or Sun in the in third house. 1. Rahu in the third house is not favourable for the birth of a younger sibling generally. 2. Rahu in the eleventh house is not favourable for the birth of an elder sibling generally. 3. There are many other researches which will be given at the end of this research.